Product information "HAIX Airpower P7 High"
Comfort and durability should be at the top of the list when looking for work boots. Of course you want comfort, as that makes your job easier, but you also don’t want a boot you have to replace every 4-6 months. You want a boot that will cushion your feet when walking on cement all day, keep your feet dry while directing traffic in the pouring rain, and to protect your feet from potential biohazards encountered on a crime or accident scene. The HAIX® Airpower P7 High will provide everything you need in black comfortable tactical boots. HAIX® Airpower P7 High Boot Gives Hours of Tactical Support. For those who must be on their feet all day, comfort is important in a duty boot. The HAIX® Airpower P7 High boots are the perfect footwear to keep SWAT and police officers as well as other first responders on their toes. These quality police boots are made with European craftsmanship and reliable materials along with HAIX® technology to keep your feet safe, comfortable, and cool while on the job. Feel light on your toes as you pound the pavement or having to stand in place with these black comfortable tactical boots. Breathable leather gives these waterproof work boots the difference you need. A roomy toe front gives your toes some wiggle rooms as well as helping to prevent blisters, while built in arch support makes sure every bone in your foot is properly supported. Two zone lacing gives you the chance to fit your boot to your personal taste for a more custom fit while also providing ankle support where you need it. Shock absorption, hot and cool insulation, and anatomically formed layers in the sole of the HAIX® Airpower P7 High boots combine to bring you a practical solution to your work gear wardrobe. Keeping first responders safe and comfortable is important, which is why the Airpower P7 High is made from water resistant and breathable upper leather and quality inner materials. The HAIX® Sun Reflect leather directs sunlight away from your feet to keep them cooler and ensures your SWAT boots look great for a long time. Your feet will stay cool longer, reducing sweat and moisture that can lead to bacteria or blisters. The boots are built to be antistatic so you have a more comfortable experience whatever the floor surface. 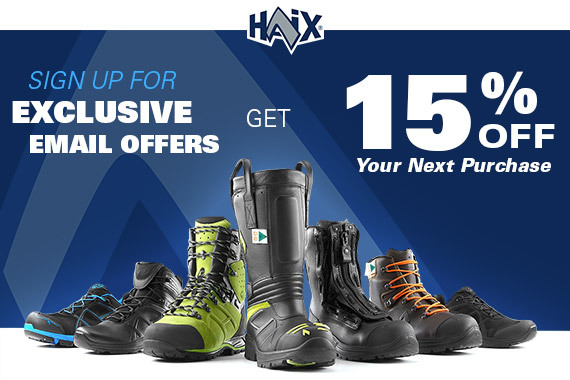 You will find your HAIX® Airpower P7 High Boot to be very breathable. The Climate System along with the CROSSTECH® inner liner your feet stay dry and comfortable; neither too hot or too cold no matter the weather outside. The CROSSTECH® liner also protects you against chemical, bacterial, and blood borne pathogens, and important factor to consider in the line of duty. For arch support you can trust, this footwear has the HAIX® Arch Support System which keeps your arches in their natural position and supported all day long. The insole of the boot is made to fit your foot in an anatomically correct manner, so that your foot has optimal support and comfort. The machine washable insert contains moisture absorption and quick dry technology and is easy to remove. Under the insole, TEXON fleece footbed supports the ankle and is formed to follow the natural lines of your foot. These boots have a sole made of rubber compound outsole material and PU wedge. The sole is fuel, oil, and skid resistant. It is also non-marking and self-cleaning with an antistatic tread for excellent grip and minimal shock. Related links to "HAIX Airpower P7 High"
Customer reviews for "HAIX Airpower P7 High"
I cant believe this new crappy lacing system. You guy's had something near perfect. I just spent 15 min trying these new boots on and another 15 min taking them off. this was my fourth pair and last pair I will ever buy, unless you revert back to the old great lacing system. If it ain't broke, don't fix it. I'll bet the NY police go to another brand. Thank you for your feedback on the Airpower P7 High. We are sorry to hear that you don't like the new lacing system of the boots. I understand your frustration but the changes were requested by New York State Police and since this is a special boot we make for them, we take their input into consideration. Maybe in the future, you will find another boot that has a lacing system and other features that you like. Stay safe out there! Overall I am very happy with this boot and I am hard to please. There is the break in and a learning curve period to get these boots dialed in. I have been on 10 hour sloppy foot patrols in these boots and ended the day dry. The construction quality is reassuring. The biggest drawback, as other reviews note, is the closed loop lacing eyelets rather than hooks. I have a wide fore foot and narrow heel. I am usually able to throw in some lace locks to get the fit just right but the closed lacing system on these boots really limits fine tuning the fit. I have R-1, R-2, P-7 high and some old Haix fire boots. Each have a different use. I sometimes get ribbed about spending so much on boots, but I think they are worth it. I can work all day long without sitting down as long as I take care of my feet. I tried to find some Army compliant Haix awhile back because of the comfort level. I ended up with a different band and can’t wait to take those off at the end of drill. I plan to try the P-7 mid for summer use. I would love to be able to go to a uniform shop and try on Haix boots, but I have not yet found a location. I have been wearing my original P7 for quite awhile. Have been refreshed by Nushoe twice. Boot is almost the most durable that I have ever owned and that includes my Danners. With the exception of when I got it back from NuShoe. Outsile wore out twice as fast, and boot now has a squeak. Not a break in issue just quality control. Out of warranty so guessing stuck with it. I agree with the other reviews about the metal hooks being removed bad idea. I can however attest that they did catch on motorcycle seat and scuff it. I attribute that to my problem not a design issue. Overall longevity is good. Break in is a beast. Thank you for your feedback on the Airpower P7 High. We are glad that you find these boots to be the most durable you've ever worn. Our boots can take longer to break in due to the full-grain leather used throughout. But once they are broken in, you can definitely feel the comfort and support. As far as the hooks, that was changed to accommodate feedback that we received from New York State Police. I apologize that you do not like the upgrades. I am also sorry that you have had an issue with NuShoe. We always recommend reaching out to them if you have any complaints about their repairs/refurbishing program. We hope this won't deter you from considering HAIX again in the future. Stay safe out there! For the last 7 years I have worn a pair of Airpower P7's while on duty as a Police Officer and without hesitation would tell anyone that asked that they were the best boots I have ever worn and strongly encourage them to buy a pair for themselves. That has now completely changed... Two days ago I received a brand new pair of P7's to replace my old ones that had finally given up. Much to my disappointment I found that the "improved" boots did away with the lace hooks, tongue keeper, and old style of interior construction in favor of closed and "locking" eyelets, a velcro tongue keeper, and a different style of interior construction. These so-called "improvements" not only seriously detract from a once perfect product, they actually make the boots less user friendly, uncomfortable, and actually cause the boot to self destruct in the case of the velcro wearing away the interior lining of the boot shaft. Needless to say, I have returned the boots and chosen to go with another brand. Also, I will no longer be recommending these boots to others as I now feel that they are an inferior product, especially given the price. Thank you for taking the time to review the Airpower P7 High boots. We are sorry to hear that you are not happy with the improvements to these boots. Theywere designed for/and in conjunction with New York State Police that we also do sell to the general public. These changes were made at their request. They said the center hook on the boot tongue was catching on their pants so they requested Velcro. As far as the hardware lacing, some troopers complained that the hooks were breaking so they asked for metal loops instead. They also wanted an improved insole for more cushion and comfort. Again, we apologize that you feel that these improvements detracted from the quality of the overall product. We appreciate you letting us know you're concerns but most of the feedback on this boot has been positive especially since the upgrades were made. I am a EEE width. I ordered the extra wide. They were very tight. Not even a EE in my opinion. So I ordered a XXWIde. Still tight. I am sending the first pair back but am stuck with shipping costs. I am sending the other pair to a cobbler in the hopes they can be stretched (can't return as I wore them outside). They appear to be very good quality but are not true to size. And on returns YOU pay the shipping, so be warned. We appreciate you taking the time to share your feedback on the Airpower P7 High. We are sorry to hear that you have had issues with the width of the boot. Those boots can run a little narrow for some people and sometimes our wide and extra wide sizes are just not big enough. Due to the full grain leather used throughout, our boots can be stretched and hopefully this solution works for you as well. As for the shipping, we do offer free returns. There is a prepaid return label in the box with the boots but unfortunately, we do not refund the initial shipping charges. We hope once you get the boots back from the cobbler that they serve you well on the job. I ordered a pair of p7 boots almost a year ago.They arrived faster than I expected,which was good since at that time it was really terrible weather outside.I love these boots and are the best made pair I have owned since I was in the military back in 1992.If anyone has any hesitation about the price of the foot ware sold here,they should put that worry aside like I did.The boots Haix makes are worth every cent and I plan on buying another pair probably pretty soon.Thank you very much for quality boots! We appreciate your feedback and are glad to hear that you have had such a great experience with your P7's We hope they will continue to serve you well in the future. This is my 3rd pair that I have bought over the years. I don't like the fact that they have moved away from the hooks for the laces. I also don't like that they no longer use Gortex. And now they are gluing the insole in the boot. So I can no longer remove it to put in a custom insole, its too tall with the factory insole in. Its still one of the best fitting boots ive ever worn. But really hate to see these new "improvements". Thank you for taking the time to share your feedback with us, we value your opinion. I will pass your suggestions up the chain! Thanks for taking the time to share your feedback with us. We're happy you made the switch, and think you will be as well. Stay safe out there! I have two p7s and three P3s. P7s are great boots but a little hot for north Texas summers. P3s were well suited for my work environment and disappointed when they were discontinued. I could actually feel the cold a/c air from the floor vents going through my P3s. BRING THEM BACK! please! Boots broke in very nicely and feel great. They seem to be very breathable and hold up good in inclement weather. Thanks for the feedback Ben, we appreciate it! The Airpower P7 High is my favorite as well. I've had my Airpower P7's for nearly a year now and I'm very happy overall. I'm a corrections officer so 12 hour shifts on my feet nearly all the time are common. I will say I was less than happy with the 4- 5 shifts of sore feet during the break in but since I got through that they've been better than any other boot I bought in 11 years and I've worn them all, Danners, Bates, Rockys, Thoroughgoods, even Matterhorns. Other than the break in the only small issue I have is the little Velcro tab on the tongue started to wear through the fabric on the inside of the boot, so I cut it off and all was well. Will be buying my next pair soon. Hi Joe, These boots can take a little time to break in, as a result of having thick quality leather construction... But as you said, once they are broken in, they are very comfortable and they will last you for many years. Enjoy your boots! I'm a cop in NYC and have to say these are great boots. They're my second pair over 9 years!!! Amaizing to have a boot that lasts yrs and provides awesome ankle support. So many people on my job have had problems with twisting their ankles and I really think these boots have saved mine a few times. Just amazed at how long they last and how good of a shine you can put on them. Not a fan of the newer styles but these are amazing and on my 3rd year with them! My other Haix were much lighter and wish you still sold them! Well worth investment that will save you money in the long run and save you from injuries. Thanks for taking the time to share your HAIX experience with us and others. We appreciate the feedback and hope you continue to enjoy your boots for years to come. Thank you and stay safe out there. We are very sorry to hear that you are not happy with your Airpower P7 High. This boot can take a little longer to break in, due to the thick, full grain leather used throughout. While this does extend the break in period a bit, it will help ensure a much longer life. I bought these from the "factory seconds" lot. I am a wildlife officer, so I need a boot with good ankle support and durable leather.I couldn't find anything to indicate they may be a factory second. I ordered a size bigger and wider than I normally wear, after reading the advice of other reviews. I'm glad I did, because the boots fit perfectly. It took a while to break them in and they're not quite as comfortable as my Danner duty boots. The leather, however, is much more durable and easier to clean than my old Bates, Rockys or Danners. My feet do not sweat in these as they do other duty boots I have owned, such as Danner and Rocky. The only thing I worry about is when I am in wet rocky terrain, they don't seem to grip on rocky surfaces as well as other boots with a softer sole, but I'm sure they will last longer because of it. Some soft soled boots grip well, but just don't hold up. Another plus I found with these boots; they don't squeak! In really cold weather, I found myself wearing the little adhesive toe warmers, as these boots are not warm without insulation, even with good wool socks. Spending long cold nights in the woods would be a lot better with some thinsulate insulation! These are the most uncomfortable boots that my department has ever issued. I'm baffled at all the positive responses. We are sorry to hear that you do not share the same positive opinion that the majority of our customers have about the Airpower P7 High. Please call our customer service department at 866-344-4249 as they would be happy to speak with you about your boots in an effort to resolve any comfort issues you might have. I can not believe that you would let someone (From: Tryptamine 5) print that on your website? I purchased my first pair of the Airpower P7 Highs in March 2013. The boots are comfortable and rugged as all hell. A great patrol boot. This past November I purchased my second pair. I just took them out of the box three weeks ago, because I didn't want to get the winter salt on them right yet. The comfort and durability is still there, but I'm not pleased with the new updates, such as the Velcro closer and the enclosed eyelets. I like the hook eyelets better, on the upper portion of the boot and the hook eyelet on the tongue. If it were for the new updates (Not new improvements) I would have given this boot a 10. I just sent my first pair to NuShoe to be recondition, a company Haix recommends on their web site. I'm hoping they come out good. I know $230 is a lot of money to pay for a pair of boots, but trust me this is money very well spent. When I started my career in law-enforcement my agency provided a boot almost identical to these for the initial clothing issue. I wore my boots for every shift for over 2 1/2 years at which time I thought I would try a different style. That was a mistake. I've been through at least five different pairs of boots from supposedly quality manufacturers (danner, rocky, etc.) and none even came close to the quality of my pair of Haix. Seven years later after I was initially issued my boots, I decided to replace the laces, insoles, and clean them up and start wearing them for duty again. They held up so well over the years they almost look like brand-new boots save for a few gouges in the toe! Ask anyone how long the typical paraboots is good for. You're lucky if you can get a year out of most. Save yourself the trouble and only cry once. Extremely well made high quality boots. I am a Correctional Officer and the boots took me about two weeks to break in completely. I have worn Danner boots for over twenty five years. The Airpower P7 high boots run a little narrow in the heel and a half size smaller then Danner Boots. The boots did finally break in after two weeks or so. I did receive the "Blue Comfort Insoles" from Haix at no charge! The boots did have a squeak/popping coming from the left boot and a little from the right boot. I thought this was possibly from breaking the boots in. It never went away. Recently mailed back the boots under the warranty(postage was paid by Haix). They were found to be defective and I should have my new boots tomorrow. Must say that customer service with this company is excellent. Everyone I spoke to has been great and very helpful!! I'll have to break in the new boots now. Hopefully there was just an issue with the other pair, as far as my left foot goes. Also, the boots seem to work well in both near freezing conditions and very warm conditions here in Florida. So, to wrap it up... Quality seems to be great. Materials seem to be top notch. Foot support in the heal/arch is terrific. Outsole seems to have good grip in wet/oil surfaces. If you happen to get a pair with a defect, no worries, their customer service is great. Comfort is good, but with any boot after 4-6 hours of constant standing I guess comfort can become an issue. I would recommend this boot for police work. I do wonder if the higher priced models offer any increased cushioning in the insole? I purchased these boots and they arrived within the specified time. Great looking boot, appears extremely well made. Materials are great. Tried on an 8.5 reg in store in different model and these fit same. The boots do only come with the standard Haix grey felt insole, which offers no cushioning. I purchased some off the shelf insoles hoping for some relief. Still not much luck. Spoke to Haix and they are shipping out their Blue Comfort Insoles. Will try these out and hope for the best. The outsoles are great and on the motorcycle I have had no slippage when feet are down. I was hoping a week into it the boots would be broken in and feel a little better. Still waiting to see. All the research I did led me to believe how great and comfortable these were. Maybe they just need more break in time. In general walking around and normal activities these boots are great. Feels like there is a little spring in my step. Have only really used them in colder weather so can't comment on the Sun Reflect technology yet, but will update in the spring. The lacing system is also great. It allows for extremely easy on/off with this boot. I also do a lot of standing in one place for extended periods of time and this is where they seem to lack in the comfort department. Time will tell I guess. I gave them an overall of 8 because I do believe these are very high quality boots. Just think my left foot isn't so compatible with them. I will update later.